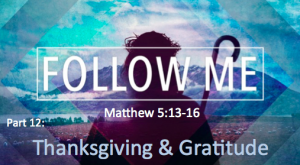 Jesus lived his life acknowledging the goodness of the Father with gratitude and thanksgiving. We should as well. We just celebrated a holiday that is all about giving thanks and gratitude. It’s actually a great idea– and biblical, too! We are called to give thanks on a regular basis. But, sometimes this can be challenging. We tend to struggle in this area (at least I do!). 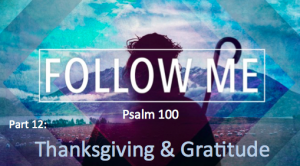 This Sunday we are going to practice gratitude. To prepare, read Matthew 26:26-27 and Psalm 100. Jesus tells his disciples that they are to be salt and light in a decaying and dark world. He also gives a warning about a problem that can hinder our saltiness and brightness. We discovered that salt can represent purity, flavor, purification, thirst, and preservation. We have also seen that light comes from Jesus, and should be intentionally visible to everyone- to bring clarity, order, direction, and safety. 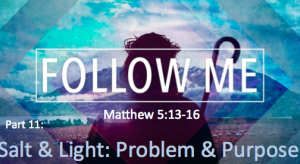 This week we will see the problem Jesus identifies in this passage and the purpose of being salt and light in the first place. To prepare, read Matthew 5:13-16. I also want to thank Michael and Tasha Hasty for opening their home for our potluck brunch after the service last week. It was a great tie with great people and great food! We will not meet for Bible study this week because of the Thanksgiving Holiday. What does it mean to be light? We discovered that salt can represent purity, flavor, purification, thirst, and preservation. What about light? What was Jesus telling his disciples to be and do? 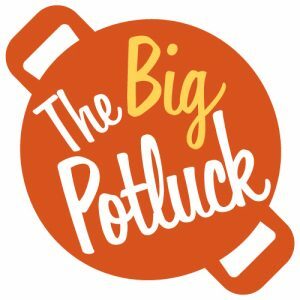 I also want to remind you that we are having a potluck brunch after the service from 11:30-1:00 at the Hasty’s (2636 Wimbledon Pt Dr.)! Bring something to share if you can and enjoy being together. Last week we heard Jesus tell us that we are salt and light for a decaying and dark world. Now, we’ll unpack those words a bit to understand what Jesus is really saying. This week, we will focus on what he means by the word salt. I also want to remind you to bring in your shoe boxes for Operation Christmas Child (along with $9 for the shipping if you are able). SUNDAY IS THE DEADLINE!